Another record breaking Japanese defence budget has underlined the once passive nation’s urgency in creating a modern defence force, but will it be enough to address both North Korea’s missile capabilities and China’s maritime expansion? A Lockheed Martin F-35A Lightning II stealth multi-role fighter in flight. Japan’s budget increase will help fund six more purchases. Credit: US Air Force photo by Master Sgt. Donald R. Allen. 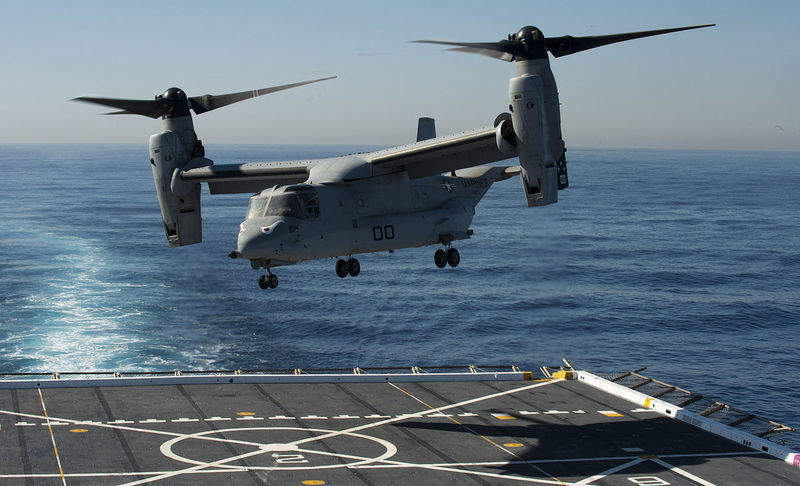 An Osprey tilt-rotor transport aircraft. Japan is seeking to buy four for its Self-Defence Force. Credit: US Navy photo by Petty Officer 3rd Class Gerald Dudley Reynolds. A Patriot PAC-3 launch. Japan relies on a layered ballistic missile defence. Credit: US Missile Defense Agency. A Standard Missile-3 (SM-3) is launched from the Aegis cruiser USS Lake Erie. Japan is looking to acquire the new type SM-3 Block IIA interceptor missiles, and also Aegis Ashore units. Credit: US Navy. “I will secure defence spending to protect our nation," says Japanese Prime Minister Shinzo Abe. Credit: State Department photo by William Ng / Public Domain. “I will secure defence spending to protect our nation, to protect Japanese people’s life efficiently, considering issues such as the security environment in Asia-Pacific region, of course including financial situation,” Prime Minister Shinzo Abe told Japan’s parliament in March and backed it up in August with a record budget request for Fiscal Year 2018. If approved, at 5.26 trillion yen (47.8 billion USD) it represents a 2.5% increase over the initial budget for FY17 and will be the sixth annual increase since Prime Minister Abe returned to office in 2012. He is a man clearly committed to his mission; in his time in office, in addition to reversing the defence cuts of previous regimes, his administration has already reinterpreted the country’s post-WW2 pacifist constitution to ease the restrictions on defence exports and allow the Japanese military to fight abroad. Now, Abe hopes that, with this record breaking budget, the Ministry of Defence will be able to address its two most pressing concerns of the moment – North Korea’s burgeoning nuclear and ballistic missile capabilities and China’s maritime expansionism. The Self-Defence Force’s shopping list unsurprisingly reflects that aim, with missile defences and systems intended to “retake invaded remote islands” featuring as high priority purchases. Currently, Japan has taken a layered approach to ballistic missile defence (BMD), deploying the high-tech Aegis aboard destroyers at sea to engage missiles in space, and land based Patriot Advanced Capability- 3 (PAC-3) interceptors to deal with any that make it to lower altitudes. Kim Jung-Un’s recent missile passes over Japan, the latest of which notched up North Korea’s longest ever flight to date, has however, put BMD firmly back in the spotlight and sparked renewed interest in improving existing defences. Some 47.2 billion yen is being earmarked to acquire the new type Standard Missile 3 (SM-3) Block IIA interceptor missiles, to hit incoming warheads outside the atmosphere and a further 20.5 billion yen for the superior PAC-3 MSE missiles, which should double the effective range of the present Patriot defensive batteries. There are also plans to introduce a new anti-ballistic missile system, with Aegis Ashore, the ground-based version of Japan’s existing ship-borne system, being the most likely purchase. Two such units would be able to provide cover for the whole of the country’s landmass, with each costing in the region of 80 billion yen, although according to the Ministry of Defence, the exact price still remains to be negotiated with the US. Tokyo is also reported to be eyeing the Terminal High-Altitude Area Defence (THAAD) system too. In addition, a reported 10.7 billion yen of the budget request is intended to update and enhance missile detection and warning capacity, which is said to be in response to North Korea’s increasing use of ‘highly lofted’ missile trajectories which make early detection more difficult for the existing systems. Another 19.6 billion yen will go to help develop a new radar prototype to enhance detection capabilities further in future, particularly since Pyongyang’s missile programme seems to be showing little sign of running out of steam anytime soon. Chinese expansion at sea forms the second clear driver of Tokyo’s latest intended boost to defence spending. Chinese vessels have repeatedly sailed into the disputed waters around Japan’s un-inhabited Senkaku islands – known as the Diaoyu in China – in the East China Sea. Such actions fit the larger pattern of Beijing’s muscular staking of territorial claims in the region, and inevitably leave Tokyo worried over what might happen next. China has, thus far, shown little regard for the rules-based system of international affairs that has held sway for over 70 years, evidently viewing the likes of the United Nations Convention on the Law of the Sea (UNCLOS) rather differently from the Western powers and their allies. Beijing has already unilaterally declared an East China Sea air defence identification zone, instigated the construction and subsequent militarisation of artificial islands in the South China Sea and comprehensively rejected an international ruling over the sovereignty of waters around the Philippines. Japanese concerns over its own remote island territories are easy to understand. The threat is not a new one. Previous defence budgets have spoken of countering the danger to “remote islands” and ensuring that Japan has the capacity to retake them should the occasion arise, but this time there is a new urgency. In 2016, one segment of an annual review staged by the Ground Self-Defence Force featured a demonstration of the hypothetical response to the invasion of an unnamed island. That was all fairly standard stuff, with troops fast-roping out of Chinooks and armour rolling across the mud of the Mount Fuji foothills; the funding request for FY2018, however, reflects an altogether more beefed-up approach. Tokyo is also set to press on with plans to establish a new ‘space unit’ within the Self-Defence Force to protect the satellites in use by Japan and the US from damage by orbiting space junk – debris, dead satellites and fragments from discarded launch vehicles, with an expected four billion yen being set aside for designing the observation system to be used. The Ministry of Defence is also likely to allocate 11 billion yen to the National Security Technology Research Promotion, a programme to fund research into the likes of domestic early-warning satellites and cyber-defence. Although this figure is the same as the previous year, it remains over 36 times more than when the initiative was first set up in 2015. By Japanese standards, the budget sought is exceptional, but it is useful to see it in the wider context of the two really big defence spenders in the region. On his campaign trail to the White House, Donald Trump repeatedly promised greater funding for the armed forces, and now as President he has set out to make good on his word, seeking a “historic” 10% increase. Although official reports show the increase in Chinese military spending slowing last year to its lowest rate of growth in six years, it still rose by some 7.6%, and there have been calls from some quarters to push it back up to at least 10% in response to the uncertainty and tension in the Asia-Pacific. If that thinking becomes the universal criterion for setting regional military budgets, then despite Japan’s sluggish economy, this may not be the last time that Prime Minister Abe will be seeking to break national records on defence spending.